Adichie, Chimamanda Ngozi; Half of a Yellow Sun. New York: Anchor , 2003. $9.38, ISBN 978-1400095209 (pa). 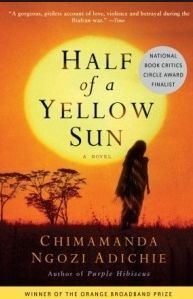 Note: "Based loosely on political events in nineteen-sixties Nigeria, this novel focusses on two wealthy Igbo sisters, Olanna and Kainene, who drift apart as the newly independent nation struggles to remain unified. Olanna falls for an imperious academic whose political convictions mask his personal weaknesses; meanwhile, Kainene becomes involved with a shy, studious British expat. After a series of massacres targeting the Igbo people, the carefully genteel world of the two couples disintegrates...."